All God's critters have a Place in the Choir!! "Then I heard every creature...singing...Be Praise and Honor and Glory and Power for ever and ever! Our visit to area Nursing Homes is coming up. We will sing a few songs with the residents. And we leave a handmade May Day gift with them too. *To aid parents in fulfilling their God-given charge (Ephesians 6:4) to bring up their children in the training and instruction of the Lord. *To help students grow in their relationships with God, others, and themselves, to help them acquire knowledge and understanding, and to develop talents and skills for responsible living and service. Please click on the Registration tab above or pull-down menu for more information. Any questions please use this contact form. Congratulations!! Miss Maddie is graduating from Grand Canyon University next week with a degree in Psychology and a minor in Communications. Mrs Lindquist is also graduating in May from SDSU with a Birth-8 Education degree. She will be teaching 2nd grade at Lakeland in the fall!! Registration for next fall continues to come in. Our Mon/Wed 4’s class is almost full with only 1 opening left. Tues/Thurs and Fridays still have room. Two Questions for You on the parent sign-in table please let us know what your interest is. Would you be interested in Summer School? And Would you use a lunch program? (answer even if you won’t be here this fall). CHAPEL for May: Offerings are going to Nebraska Flood Relief. Both Cassie and Rachel lived in the areas affected by the flooding and have friends and relatives affected. Chapel is on May 1 & 2. Field Trip: All Classes will be going to the nursing home to sing and then to Destination Playground on April 29 & 30. Please sign the permission form online on this page. We will need parent chaperones for this trip. Do You Shop at Cash Wise? If you already have the MORE Rewards card for Cash Wise: go into your account-rewards tab then education or schools. 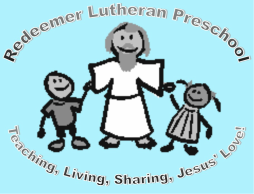 Choose Redeemer Lutheran Preschool. At checkout the points are added to our account. If you don't have an account yet sign up at moreRewards.com. Your friends and relatives that live in a Coborn's, Cash Wise or Marketplace town can also designate Redeemer Preschool on their rewards accounts. Preschool is always looking for more cartridges to recycle. We send these in for Cash Back. We also use the rewards program at Office Max so all of those ink cartridges save us money. Milk Caps from Kwik Trip can be saved also. The collection area is by the gym. We are a 4 Star Parent Aware rated center. We qualify for Parent Aware Scholarships. Please check out the link below to see if you qualify for preschool tuition funds. By submitting this form you- the parent- are giving permission for your child to participate in this event. It is understood that all events will have adult supervision. Also, We (I)by submitting this form hereby voluntarily waive any claim against Redeemer Lutheran Church and preschool, all sponsors and the owner/operator of the bus furnishing transportation to this event (if applicable).